Let’s just quickly dismiss these shoes as racist. As quickly as we turn against – and then for, and then probably against again – our most talented athletes. Let us take absolutely no time in digesting these shoes, everything designer Jeremy Scott is presenting us. Look at them. They are obviously a callous and reckless image referencing either intentionally or not our country’s biggest stain. 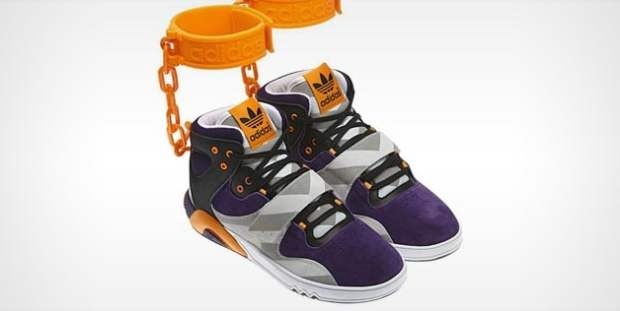 Let us call upon Jesse Jackson to condemn ADIDAS. Let us flood Twitter and Facebook – our most awkward and active demonstration of democracy – in an effort to have the shoes pulled. These shackles are not a metaphor. These shackles are a concrete reminder of how this country was built. You cannot look at these shoes, let alone wear them, without feeling the weight of that horrible transatlantic slave trade. We, the public, the loud and blunted mass did our part. Shaming ADIDAS into a corporate apology and ceasing production of the shoe; Jeremy Scott issuing a claim of ignorance and citing a children’s toy for his inspiration. We take democratic change where we can get it, I suppose. A long and breathy “Christ,” I issue. And not with respect to what the shoe does or does not symbolize, but the absence of discussion regarding these shoes. Perhaps it is that they are a product, mass produced and replaceable, that we don’t give them the space for discourse. Were these displayed at some ultra-hygienic gallery on Crosby Street we would be slugging wine and farting around about how layered the shoes are, how complicated it is to unravel just exactly what the artist is trying to say. And that is where the danger lies, the shoe as a product. As a singular object, only a select number of people would see it initially. They would write reviews; they would start the conversation. As a wearable shoe with which we all could potentially come into contact, we understand the danger that not everyone will be able to think slowly about it. The shoe could confront us more than once in a week, and the shoe would confront us at unplanned times. The charge of the design being racist, then, as a product makes sense. The shackle and it’s relation to slave and prisoner life is undeniable. And for a large part of the population, it is too much to ask of them to ignore its symbolism and appreciate the layered meaning (or grossly, the fashion). If we let the shoe exist, briefly, as a piece of art our discussion is much longer. We let ourselves be indulged with conspiracies and outlier theories in all things sport, so let us clog up the bandwith with a few more scrappy ideas. Let us go for the front-runner, that which has already been deemed problematic when dealing with the shoe as a product: slavery. The slave trade was and still is a practice beyond horrible. A shoe, then, that so obviously reminds us of the practice is powerful and does well to needle itself into our conscience. It removes the disconnect between the origins of the shoes and the stores in which we by them. We could let the shackle shoe fill us with guilt; ignoring the means of production would be impossible. There is also the often-employed metaphor of slavery in modern sports. The details and full understanding are too complicated and heavy for this nascent booger to understand, but quickly and lazily spelled out here as black men dominating the playing field, white men dominating the front office, a concern for the company’s success, lack of concern for player’s health and so and so on with truths and perversions sprinkled throughout. The athlete must wear sneakers on his feet to compete, thus a shackle affixed further reinforces the idea of professional sports as a version of the modern slave trade. Again, as its existence as a shoe sold in stores, this idea feels like a stretch, but as an item of art, there is little doubt we would not be discussing the previous point. Another and more broadly applicable idea is that of a trolling nature by the designer. Shoes are an obsession to many, and in general we simply lust for products, things. Here we have a shoe which shackles itself to you, thus reminding you every time you lace that you are indeed a servant to needing things, consuming. Lola Adesioye, over at the Guardian addresses this idea in one of the rare mindful responses to the shoes. To exist as a shoe, I concede, these things are problematic. They are also ugly, but I’ve worn the same pair of canvas turds for three years so that’s not my call. It is good that ADIDAS has pulled production, but also just as valuable perhaps that they now only exist as an image, floating in that ether. We have them ready to pull up on our screens at will; we can look at them in the safety of our homes or, the willingness of a plucky teacher, a classroom. Now, in their non-existence, we can consider them as nothing more than art. And we can allow ourselves the time to use them as another cultural mirror.